Eclectic patterns, vintage pieces & global influences are key. Nowadays, in relation to style, "boho" is a term used to define things that are unconventional and artistic; however, it helps to understand the roots of Bohemian style in order to pull off the look authentically in your home. So what does boho really mean? Well, first, it's shorthand for the French word bohémien, referring to gypsies and termed after a particular group of people who traveled from Bohemia, a region in the Czech Republic. The word later evolved to include any artist, writer, actor or musician who was often poor and led a nomadic lifestyle, traveling quite a bit throughout major European cities. A more recent hotbed for boho culture existed in Greenwich Village in New York City during the 1950s, otherwise known as the beat generation, which eventually gave way to the hippy culture of the 1960s and 70s. Today, bohemian is more of an adjective than a noun, and indicates an aesthetic that takes its influence from those free spirits of generations past. The modern boho-chic look is eclectic, and with an emphasis on ethnic and vintage pieces from the 1950s, '60s and '70s. Here are the top 5 ways to embrace boho chic style in your home. There is a foolproof formula for mixing and matching throw pillows like a pro; but, when it comes to creating a boho chic space, all rules go out the window. Bright colors and lots of patterns such as florals and paisleys mixed with ethnic patterns like tribal prints and geometric patterns are a hallmark of boho chic style. If brights aren't for you, embrace a subdued mix of shades like olive green, cognac, mustard yellow and rusty oranges. Even in an office space (like this one featured in The Everygirl) you can throw a mix of pillows and throws on a day bed or simple sofa for a layer of extra comfort, style and eclectic energy. The hippy influence of the 1960s and 70s on boho chic style ushered in an infusion of accessories that utilize natural or raw materials such as hemp, sisal, wood, and rattan. Think woven wall decor, macrame plant hangers, a sisal area rug, a leather footstool or a decorative ladder. Although natural textures are key, don't let that stop you from throwing in a metallic Buddha or metal floor lamp for a little shine. Given that boho culture has a history of celebrating wandering artists, home accessories that have a global feel are important in a bohemian-inspired space. Items like Buddha statues, Moroccan lanterns, Indian tribal prints, and Ming-style vases and urns all achieve a global look. If you're lucky enough to travel to far-flung locales, look for beautiful souvenirs that can help you achieve an ethnic-eclectic feel in your home with authentic pieces; but, if you don't have that luxury, shop at import stores or retailers like Pier 1 and World Market for global accents that are budget-friendly and closer to home. Then again, you can also decorate with an actual vintage globe, a quirky and charming travel-centric addition. Like any eclectic, interesting home space, boho rooms make creative use of interesting and unique vintage pieces. But rather than American primitive pieces or rustic flea market finds, this style actually focuses more on mid-century modern accessories as well as anything reminiscent of the free spirit hippy culture of the 1960s and '70s. For example, a mid-century arc lamp mixed with a tribal print rug and a gallery wall of magazine covers from the 1970s will achieve the look flawlessly. No bohemian space would be complete without a curated, creative mix of art and books. In fact, beatniks of bygone eras likely owned way more books than they did clothing, furniture, or other material possessions. If this decorating style appeals to you, you probably already value the arts, so you're well on your way. 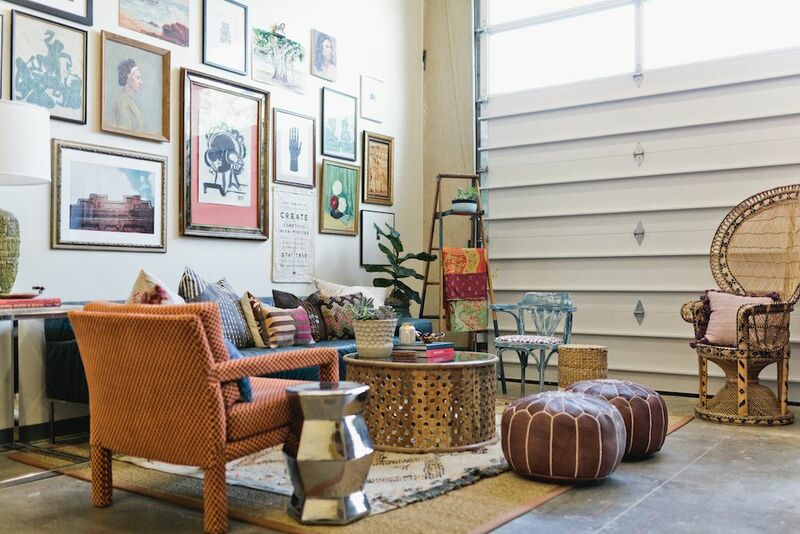 A goal of creating a boho space gives you a license to pile art books on the coffee table, frame album covers as wall art, or hang an eclectic collection of art prints on a gallery wall that stretches floor to ceiling. There are really no rules—and definitely no rhyme or reason—to how your art collections and objets should be arranged, and we encourage a whimsical approach wherever possible. Finally, and perhaps most importantly, keep it casual. Boho chic spaces are not fussy. Think floor cushions and poufs; piles of pillows or a comfy area rug; and spaces that encourage conversation, reading, and listening to music or playing games rather than watching TV or hosting formal dinner parties.